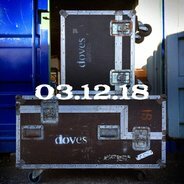 Doves have been on ‘hiatus’ since 2010. While their old albums haven’t lost any of their beauty (indeed, your scribe spent last winter playing Kingdom of Rust), more music would be good. Well, something is happening. We don’t know if it’s a single, even an album, or a tour, but they have posted a cryptic clue to their Twitter: travel cases with Monday’s date across it. A gig of some kind seems most reasonable. We really hope it’s a full reunion.